Everything begins with soaking the wooden vats. They are only needed at this time of year and have become like real sieves. 3 weeks of work are needed. We must go slowly and gently moisten the wood so that it does not break. Then we must straighten each stave and plug the holes. Then we completely fill the vat with water to test it. Some of our vats are very old. Thanks to a Burgundian barrel maker, we can keep them in good working order. He has repaired several of them. Wood is a noble material and is living. Unlike stainless steel, metal or concrete, it holds within itself properties relevant for the harvest, mainly native yeasts (levures indigènes). Therefore, it is not helpful to add yeast to start off the fermentation of our juice. This is a huge advantage and a guarantee of quality. It is necessary to bring out all the equipment for the grape harvest and to prepare it: the crates, buckets and clippers, the salk, conveyor belt, presses, sorting table; not forgetting the housing and food for the pickers. This is an important organisation where each person in the team has a role to play. We collect all our grapes manually in crates of about 30kg. This is essential so that these reach the cuverie as whole as possible. Some years a sorting is necessary. This is carried out at the cuverie. 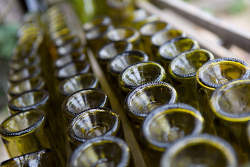 It allows elimination of dry grapes, rotteness or any verjuice fallen inadvertantly in the crate. 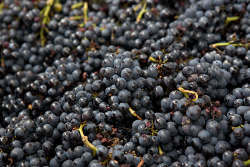 After a light pressing (foulage) , the grapes are fed into the press. Since 2000, we now use vertical presses of the champagne cage type (after several years with a pneumatic press). The pressing is more delicate and the surface of pressing less substantial.. There is no systematic turning over. The juice filters naturally through the thickness of the cake (mass of the grapes). The remaining lees are then finer, they generate a nutrient supply, and give more fatness and sweetness. 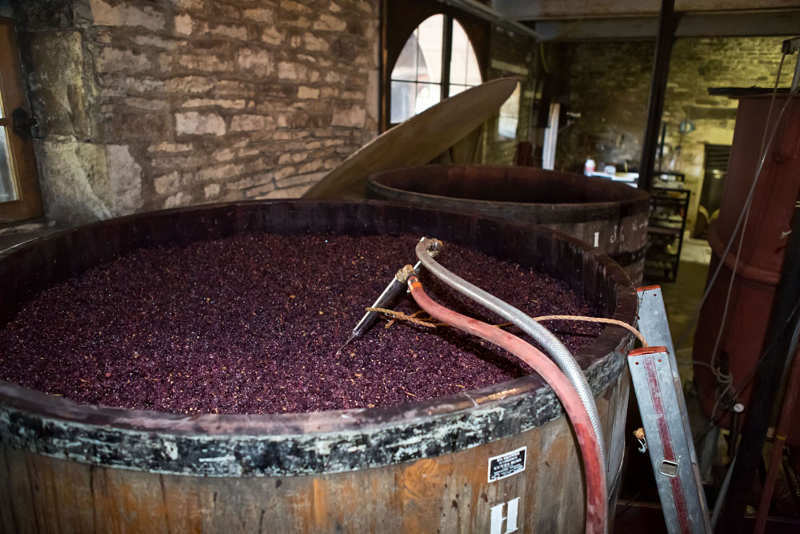 The harvested juice will remain 3/4 days in the vat to be decanted (the solid material settles at the bottom). It will be put into a barrel or wooden vat to start up the fermentation . By putting an ear to the opening of the barrel we hear it sing and bubble, a real sweetness. 100% de-stalking (égrappage) without crushing is done. 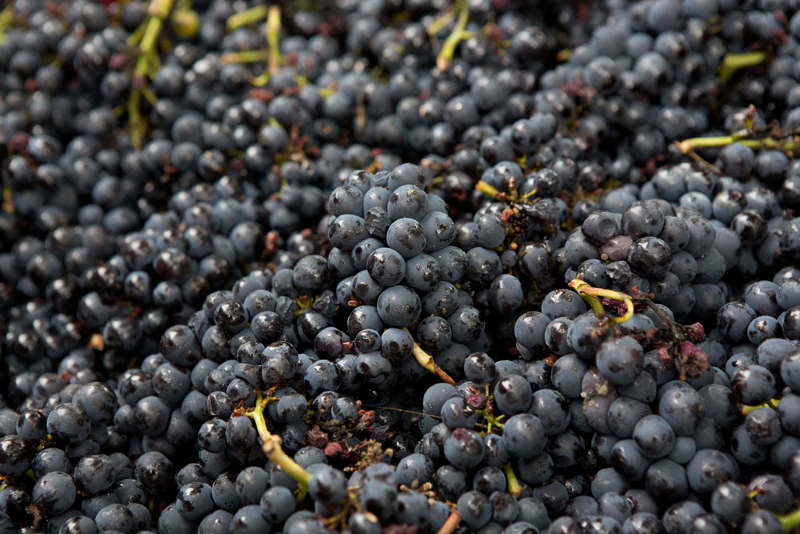 Some years we add directly into the vat the entire grape picking, up to 30%. 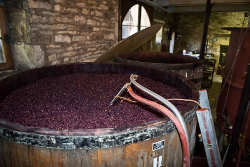 The grapes are then fed gently into the vat by a conveyor lift. The juice is transformed into alcohol, the fermentation is activated. We intervene only by twice-daily pigeages . This operation is delicate and needs precautions. The release of carbon dioxide which emanates from tanks can prove to be dangerous. The skins add to the juice substance, colour, complexity and finesse.We also monitor closely the temperature and density in each vat. When it reaches the end of the fermentation, we press and collect the jus de presse and the jus de goutte before it is placed in barrels or wooden vats. Each vintage gives the same pleasure, the same sensations. The smell that emanates from the fermentation in the winery is a true delight. It brings back memories and completes marvellously this period of intense activity. It does not happen immediately at the beginning of the harvest, it tantalises. But when all the vats are fermenting in the winery, it's fireworks, a mission accomplished. A few years ago we invested in wooden storage vats. 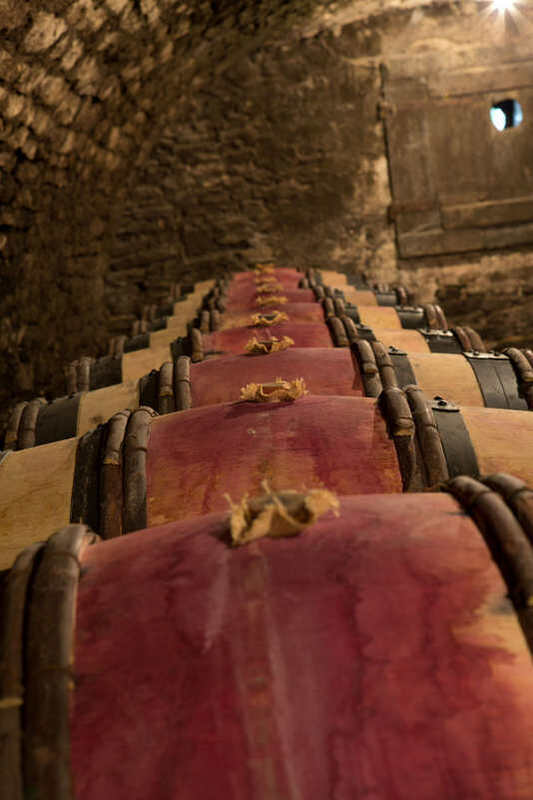 Of varying capacity ranging from 35hl to 70hl, they are made of oak a few kilometers from Beaune. By this approach, we are looking above all for freshness and fruit. Each of our vintages is therefore matured partially in vat and the remainder in barrel. Producing the wine starts at the harvest. Each week we top-up (ouiller) to leave no air space. The share of the angels, as we call the loss absorbed by the wood, is perhaps unavoidable in the first months. We wait for the second fermentation, the malolactic fermentation . This can be happen quickly or be delayed for several months. It is essential to stabilise the wine. We let nature take its course. The analyses of the wine show us the progress of this, as well as the degree of alcohol, the turbidity, the acidity, the levels of SO2 and CO2 and many other things which allow us to follow the maturation with serenity. Before the subsequent harvest we carry out a decanting, vintage after vintage. 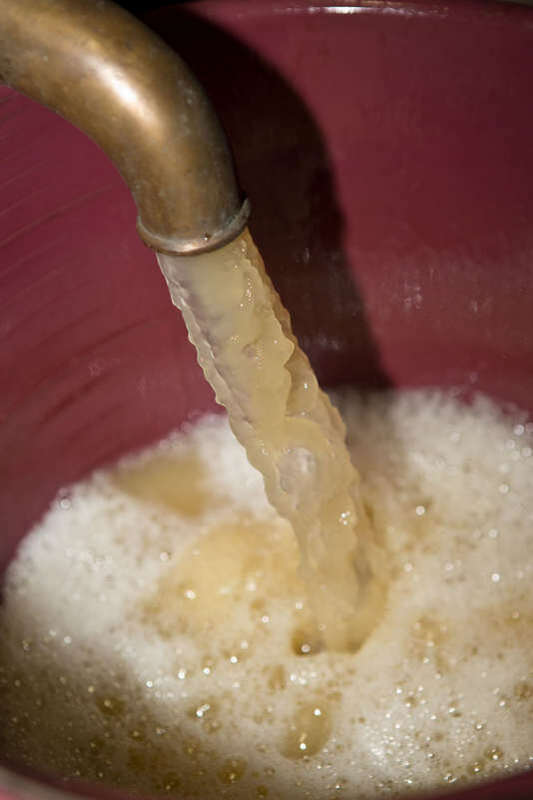 The aim is to homogenize and eliminate all remaining lees . The maturation of the whites lasts 15 months, and of the reds from 18 to 20 months depending on the vintage. The bottling is scheduled depending on the vintage, tasting the wine and according to the lunar calendar, always carefully and without haste. A week before bottling the wine we decant the vintage and filter over kieselguhr. This technique does not fatigue the wine and allows the filtration to be tailored. We then allow a week before the bottling is done by gravity. We use a high quality bottling plant, bought in Cuma (cooperative use of shared equipment). Very compact and easy-to-use, it provides automatic leveling and sealing under vacuum. It handles 900 bottles per hour. The wines are stored in the cellar for a few months before sale.